As a young child, I had no serious body strength. I think this can be said for most young children. Keeping this thought in mind, it is strange to me why anyone ever bothers teaching children how to ski. In lessons, they are taught how to make “french fries” and “pizzas” with their ski blades. One move helps them move down the hill. The other move helps them slow down before coming to a complete stop. Anyone who ever attempted to ski at a young age knows that no matter how many clever food analogies exist are offered to amateur skiers, there is no shape of food that can help prepare anyone from the fright of zooming down a slope for the first time, inevitably causing them to freak out, causing them to forcefully sit on their bottoms before they run into anyone or anything. When I found myself wiped-out, my next move should have been to lift myself back up onto my skis, and then try again to move down the hill to flat, comforting land. But again, I was a weak little thing, and try as I might to hoist myself back up into a vertical position, I found it easier just to forcefully jam my ski pole into the back of my ski boot, freeing me from the confines of my long ski blades. I managed to stand up, my toes scrunched into my shoes, and I proceeded to tap the snow off of the bottom of my shoe, slam my shoe as hard as I could back into the ski, and try to maintain my balance so that the procedure could be repeated on the the next ski. This cycle was never ending, and perpetually exhausting. My father – a pro ski lover – found it hard to motivate my sister and I to keep trudging on down the slope, repeating our jamming, stomping cycles, while at the same time trying not to lose his temper if we accidentally traveled too far down the hill out of his line of vision. We were going to fall down soon again anyway – it was not as if we were going to travel too far. Eventually I learned how to steady myself on my skis, thanks to continuous visits to ski destinations, so that I could start to love the thrill of rushing down a hill, the cold breeze refreshing my senses. 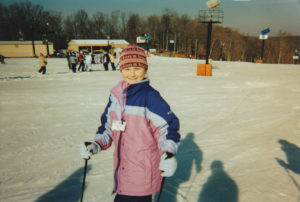 I was able to grow into a confident skier much in part to the accessible ski destinations right here in Indiana. 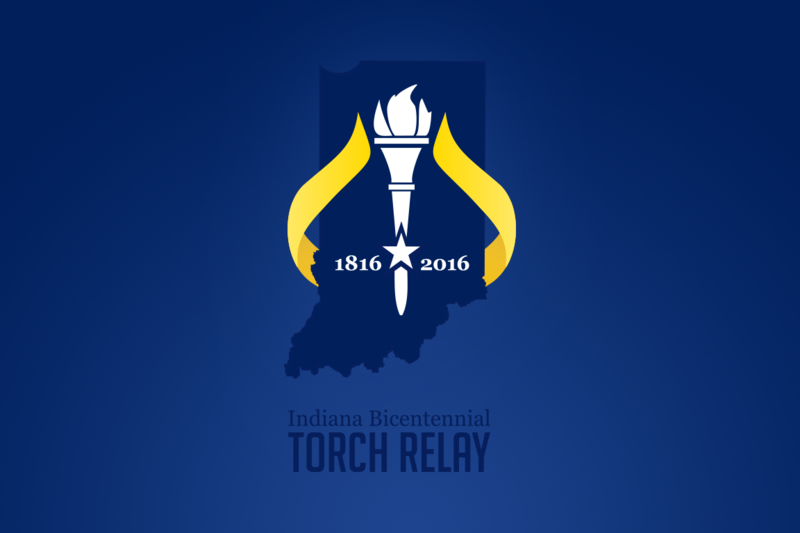 Yesterday, the Bicentennial Torch Relay passed through Dearborn County, home to Perfect North Slopes in Lawrenceburg, Indiana. A few days prior, the torch passed through Orange County, home to another popular winter attraction, Paoli Peaks in Paoli, Indiana. 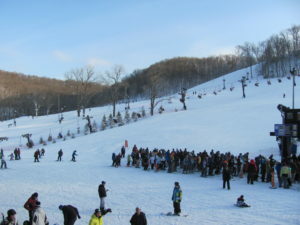 Neither of these locations are ski resorts, but rather, offer various slopes and other winter sports for the public to enjoy, such as snowboarding and tubing. Throughout the months of December and March, these attractions will collectively see 350,000 skiers fly down their slopes (1). Vertical drops of 300 – 400 feet are made possible at these destinations due to the naturally hilly geography of southern Indiana (2). Another similarity that these two facilities share is an average of 18 inches of snow that they receive during ski season (3). Each location is incredibly gorgeous. As a child, riding up the ski lifts to the top of the slopes was terrifying as all-get-out, especially the threat of falling flat on my face once I had to slide off of my seat once the lift reached its destination. However, being able to view the rows of green trees at such a high altitude, and being able to enjoy the serene calmness, almost made the trip worth it. During the off-season, Paoli offers many other attractions that take advantage of its picturesque, outdoor landscape. Wilstem Ranch is a unique place, in that it offers many different types of activities to experience, such as an annual pumpkin patch and an elephant retreat. There are many shopping centers to visit in Paoli as well, such as the Lost River Market and Deli and Persimmon Tree Gifts. Apart from its many attractions, Paoli played a significant part in Indiana history; in 1805, just about a decade before Indiana officially became a state, Paoli was declared the initial pivot point for survey of all of the boundaries in Indiana (4). 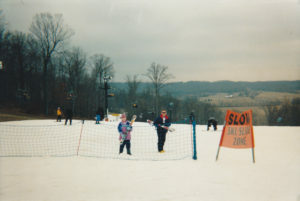 Lawrenceburg also hosts fun events throughout the year when Perfect North Slopes is not in operation. The annual Lawrenceburg Fall Fest is taking place later this week, from September 22 – 24. Other attractions to visit year-round include the Hollywood Casino Lawrenceburg and At The Barn Winery. 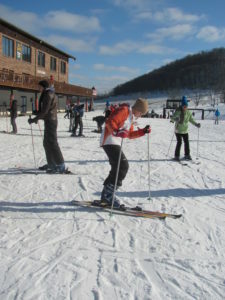 If you’re interested in visiting these Hoosier skiing attractions, but are maybe hesitant to ski if you’re a novice, do not worry – both locations offer beginners courses for everyone of any age. During these courses, you too will learn the power of fast-food shapes. Plan a visit for Paoli Peaks by clicking here. Plan a visit for Perfect North Slopes by clicking here.